It's hard not to admire the thought that Classeq have put into these new warewashers. The attractive new design looks great anywhere and actually simplifies operation. Mechanical buttons have been replaced by digital control, meaning stylish lines and an easy-to-clean fascia. The new machines are available in two ranges - Standard and Duo. The main difference between Standard and Duo is the added functionality. Standard have a single, fast wash cycle. Just fill the machine, press the button and go. Simple. Duo machines have two wash cycles - either a standard two-minute full wash, or a rapid 90-second cycle for lighter loads. Duo washers are also fitted with a built-in drain pump as standard, making installation more flexible. Many of the changes are under the hood, designed to help the warewasher work faster, quieter and more efficiently. 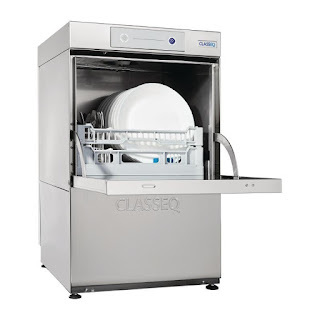 To see for yourself, check out the range of New Classeq Dishwashers and Glasswashers.